GET YOUR TEAM TO WORK MORE INNOVATIVELY. You have a great team that performs well and does not disappoint you. they have accomplished many targets, at times s before the deadline .they have won you awards and accolades across the organization and even got you the promotion you aimed for.but it appers that they are stuck in a rut and are refusing to innovate lists important tips to keep in mind to get your team to thinks out of the box. B)	When people are passionate about work innovation follows the commitment to innovation is crucial and should be visible to the organization. A)	innovation is about gaining different perspectives to address a challenger or an opportunity. its good to create cross functional teams that can work on time bound projects having people from various functions come together allows for cross pollination of ideas and encourages individuals to think out of the box and beyond their functions/roles, says Pavan Dhamija. 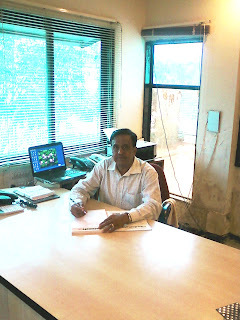 B)	MD & CEO ,DLF Pramerica life insurance. also identify how your team can do work differently on the same project in order to create or, add value. A) setting ambitious yet achievable goals/targets enhances team productivity and gives a moral boost to employees once they achieve their targets, so that they keep on coming with better and innovative. B) AVR,HR, tulip telecom promoting competitive learning amidst team is important as learning is a continuous process, adds singh. A)	a culture recognition help drive innovation. team members should be encouraged ti share their thoughts and innovative suggestions/ideas should be supported. B)	Every possible manner says dhimiji even though all ideas and innovations may not be great manager should be receptive and encourage them, ”says Goal. A)	companies can make investments to train employees to think innovatively by facilitating their participation in training programmers. giving them live cases studies and projects to work upon and so on this extremely satisfying for employees who are keen to contribute. and make a mark adds Dhamija. B)	Another investment one can make is in procuring latest technology to keep your business growth steady and profitable technology breeds innovations. Mr Ganesh and his team crossed 10 crore billing in July. All dispatches completed on 2 nd of August. With heavy load of billing completed the dispatches on time. They are completing stock taking. New lanch CC and Roff division in Pidilite depot. Congratulation to Sachin , Ganesh and his team. Mr Gaurav and Mr Pravin has joined Pidilite depot Both are MBA from reputed institutes. Mr Vishal Kamble has joined in accounts department he has done his Bcom . Welcome to all of you wishing best for the opportunities in upcoming future. Mr Ganesh Omble and his team has completed dispatches on 1 st itself. Amway depot has crossed 10,000 invoices for July which was average 7300. Congrats to mr Ganesh and his team. Mr Ganesh & his team has taken initiative & done activity of week for NTBU arrangement in new manner which is appretiated by Mr Avinash sharma Regional head Amway RO office. Wishing best for their new initiatives.!!! Adani depot has completed month end on 31st with dispatches. Adani depot has started new sms system for intimation for parties depositing cheque before 2 days and on depositing day. Good initiative taken by Yogesh and his team. Exide depot has completed the dispatches on 2 nd of august. They are taking good initiatives for making stock and stream line the working. We have conducted WORK SHOP on CEASE FIRE handling on 14/07/2011 at 4 pm to 5.30 pm. 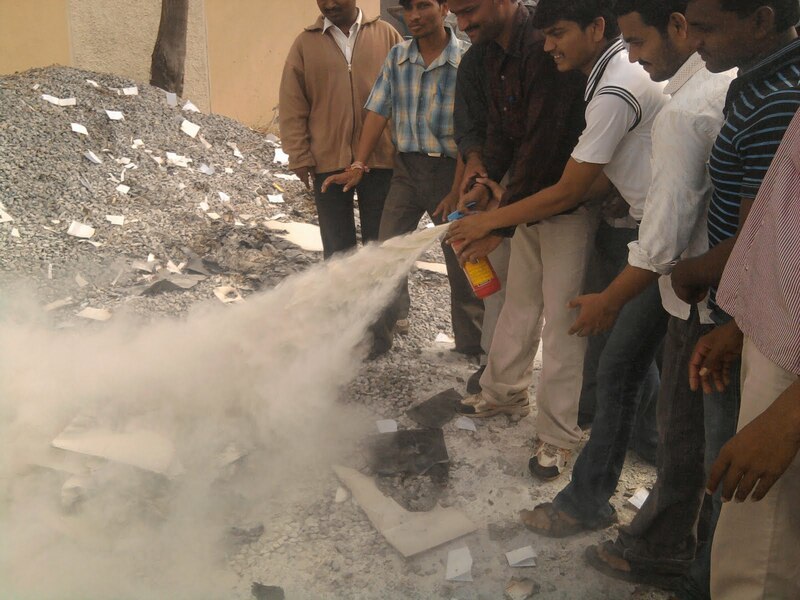 In Work Shop alongwith Practical demo many other things how to handle the Fire situation well explain by him . 1) The work shop has conducted a professional trainer from Ajit Fire Engineers. a) Water tank or tap & long pipe. c) All three type Cease Fire in adequate quantity. e) Training for fire fight. 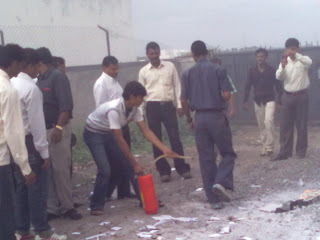 2) If Fire is Big do following things first. b) Cut of Electricity & called to MSEB too. c) Vacant the place i.e . Remove all the human beings from that place. 3) If is small do following steps immediately. 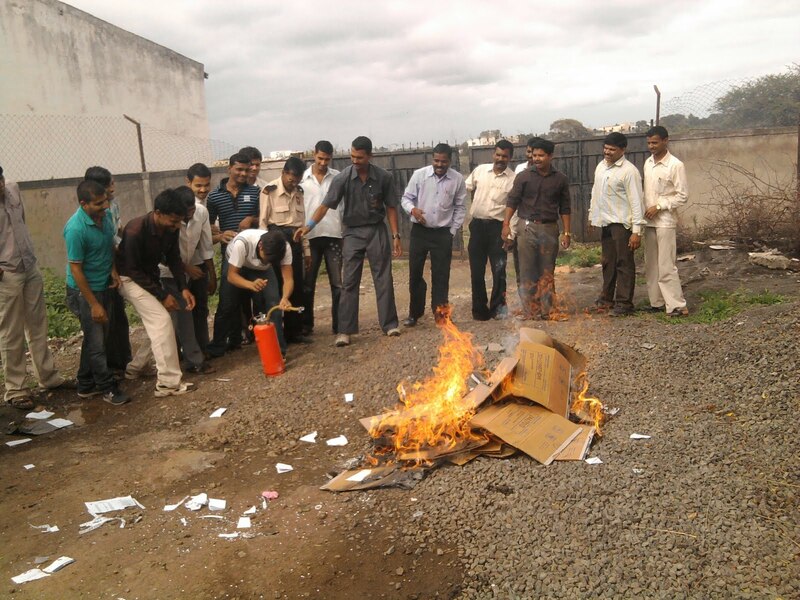 d)If Fire due to & Cease Fire Type Use on that particular material. i) Fire to Wood , Paper Use Type "A'" Cease Fire which contains Water & Gas Cartridge. iii) If Fire due to Wood , Paper, oil & Kerosene , electricity , LPG gas than Use " A B C " type Dry powder & nitrogen containing cease Fire cylinder . 4) How to handle cease fire cylinder. a)Keep it at place of entrance & easily accessable spot or wall mounting place. other wise we will fall down & injured that person & cylinder might open . between person & fire must be 5 to 7 fit & for liquid cylinder of water distance must be 10-15 fit from Fire. In above training all the staff of Lupin depot actively participated. In Lupin in surprise audit of stock found no discrepancy in sample taking stock also Mr. Avinash Shrivastava – RCM has visited on 14.07.2011 given lot of good information regarding working & approach toward the work also update importance of GRN. During the month from Lupin depot Mr. Nasir Shaikh has visited Narayangaon & Manchar distributors has from wockhardt Mr. V Patil has visited Nasik distributors. Feedback of customers very good regarding the services. Lupin & Wockhardt team had done good activity of timely dispatching of month ending billing in spite of heavy billing on last days of month. Surprise from Lupin have entered into a strategic collaboration with Eli Lily India to promote and distribute Lily's Huminsulin Product range.